Kia No 3 | What Car? 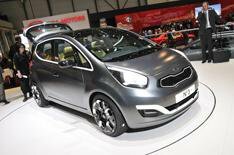 Kia's centrepiece at Geneva sounds like something from cult 1960s science fiction show The Prisoner. It's the No 3 concept, a glammed-up version of the mini-MPV the company plans to introduce late this year. The show car's windscreen flows into a panoramic sunroof, separated only by a slim diagonal bar, but otherwise this is pretty much the good-looking model you'll be able to buy. It is based on the same platform as the recently-launched Kia Soul and parent company Hyundai's i20. The engines are likely to be a selection of 1.4- and 1.6-litre petrols and diesels from the bottom end of the Cee'd range. The styling was done in Europe under Kia's German design director, Peter Schreyer. The lights and grilles show the new face of Kia that Schreyer is developing for the brand. Inside, the rear seats fold, slide and recline, but Kia will be pitching the car as a stylish and spacious supermini-plus rather than a workaday MPV. It measures just less than 4.1 metres from front to rear. As for what the production car will be called, it is widely rumoured that the decision to call the show car No 3 concept indicates a possible switch from names to numerals for future models from the Korean company.